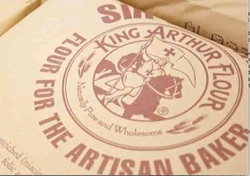 King Arthur Flour Non GMO (type 55 and bread), European-style butter (cream, natural flavorings), water, salt, lemon juice. Unbleached Enriched Wheat Flour [Flour, Malted Barley Flour, Niacin, Reduced Iron, Thiamin Mononitrate (Vitamin B1), Riboflavin (Vitamin B2), Folic Acid], Water, Partially Hydrogenated Vegetable Shortening (Soybean And Cottonseed Oils Colored With Beta Carotene) Contains 2 Percent Or Less Of: Salt, High Fructose Corn Syrup, Wheat Gluten, Distilled Monoglycerides (From Hydrogenated Soybean Oil) And Soy Lecithin. 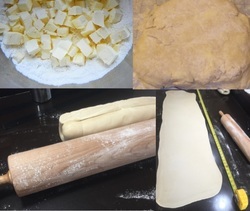 Traditional style french puff pasty using detrempe and butter-block method with 6-7 turns, resulting in over 796 individual layers. We use a balance between type 55 flour and bread flour for flakiness and flavor. 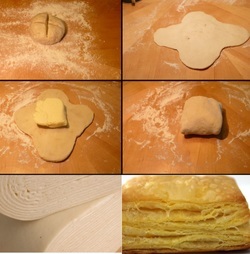 We make our own hybrid puff pastry, using a Scottish or rough puff method. To optimize flavor and strength and to make the pie "handheld", it needs a higher bread flour content and lower butter content. The butter content is reduced to 45% (of flour weight).